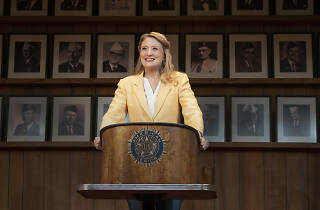 Heidi Schreck’s play has tears on its cheeks and the torch of liberty in its fist. 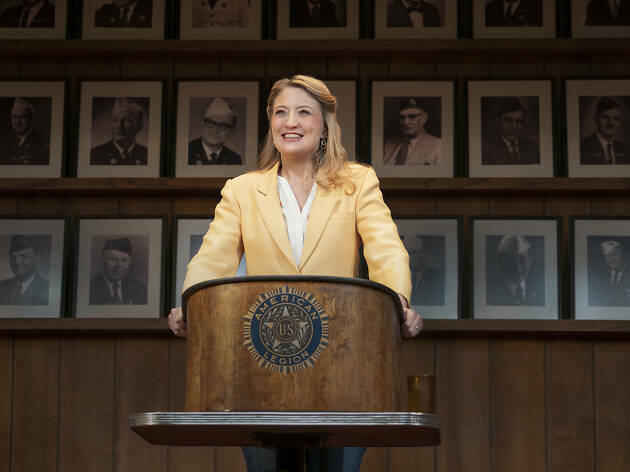 There’s a sense of rightness—a final puzzle piece fitting into place, a key clicking into a lock—about Heidi Schreck’s quasi-solo play What the Constitution Means to Me moving to Broadway. It has always been about rhetoric and amplifying women’s voices; it’s the rare indie theater piece that doesn’t require intimacy. Does theater matter? Is it necessary? Sometimes our razzle-dazzled hearts aren’t sure. But here is something that every citizen must see: It’s theater in the old sense, the Greek sense, a place where civic society can come together and do its thinking and fixing and planning. Schreck starts her address to us at lightning speed in a scene-setting introduction, telling us that, when she was 15, she participated in American Legion oratory contests, eventually dominating the vet-sponsored speech-giving circuit enough to pay for college. With the aid of an American Legion moderator (drolly played by Mike Iveson, in oversize 1980s pants), Schreck re-creates her “terrifyingly turned-on” younger self, whose enthusiasms included Patrick Swayze, witchcraft and civic responsibility. “The Constitution…is a living, warm-blooded, steamy document!” she cries, and for the first time in your life you imagine the Constitution with its shirt off. The performance is itself an exercise in critical thinking. Schreck almost immediately goes “over time” to talk about how the Constitution has both liberated and imprisoned women’s bodies. She burrows into her own family’s painful past of spousal abuse; in one section, about her grandma Betty, she has to read from notecards so that she can muscle through the text without crying. In two years of building the show, Schreck has crafted a powerful argument that uses everything at hand: legal analysis, a dive into history, a consuming rage at sexual-assault statistics and her own very personal reasoning. (There’s a scary and hilarious audio recording of Supreme Court justices that’s worth the price of admission.) When her own raw grief threatens to overwhelm her, she invites a young local debater—either Rosdely Ciprian or Thursday Williams—for a sparkling debate, which offers tangible hope for the future. The text itself doesn’t seem to have changed since its Off Broadway run last year, yet the show has deepened, sweetened and strengthened in its move to Broadway. At every stage of Constitution’s growth, Schreck has seemed like a flame herself: a brave little candle at the tiny Clubbed Thumb Summerworks festival in 2017, a steady hearth at New York Theatre Workshop. Now she’s in the big room, on the big stage, and Broadway’s oxygen has turned her into a wildfire. On the night I saw the show, the audience roared its response. We went up like a dry prairie before her. Hayes Theater (Broadway). By Heidi Schreck. Directed by Oliver Butler. With Schreck. Running time: 1hr 40mins. No intermission. September 27 was a strange day to see What the Constitution Means to Me. Heidi Schreck’s excellent close-to-solo show hasn’t changed much since its short run in Clubbed Thumb’s 2017 Summerworks festival: It is still delightful, still passionate, still data- and detail-rich. Schreck tells us her (true) story of earning college money by winning oratorical contests, which had her traveling around the country delivering a short speech on the Constitution and competing in rapid-fire challenges about its amendments. Standing in Rachel Hauck’s poetic reimagining of an American Legion Hall (Mike Iveson plays a Legionnaire, complete with a little soft hat), Schreck tries to recall what she might have said at 16, when her patriotism was heavily flavored with horniness and a love of witches. Her reconstruction goes “over time” when Schreck relates how the government has and hasn’t protected women, citing statistics and cases as well as her own family’s hellish experiences. The show offers a compelling mix of earnest sweetness and thundering mountaintop fury. As the show began on the 27th, though, the Brett Kavanaugh confirmation hearings were still ringing in the audience’s ears, and Schreck—a fizzy presence—cried through nearly the entire performance. So did I. Yet there is more in Schreck’s piece than a pure appeal to emotion; there’s a deep and rational argument about the purpose of rhetoric, the value of giving a girl a podium. At the end of each of Schreck’s performances, a real-life young local debater comes out to issue some gentle correctives. Schreck has embodied the uncertainty and anger of a woman in her early 40s, but now we see the poise of a later generation. Schreck and her director, Oliver Butler, leave us with images of hope, calm and the power of the unhurt—a sort of living, breathing amendment, changing the old to insist upon a smoother path for the new. New York Theatre Workshop (Off Broadway). By Heidi Schreck. Directed by Oliver Butler. With Schreck. Running time: 1hr 30mins. No intermission.